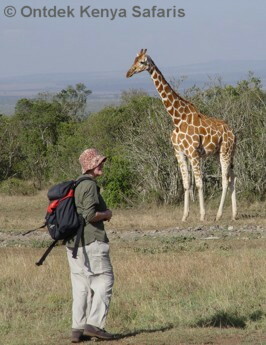 Click here to go to page 1 of this 10 days Africa hiking safari. An early rising will ensure that one gets another magical display of the various birds. After breakfast we do a short transfer by car to the nearby Crater Lake nature conservancy. It is a lesser lake in the Rift Valley but a place where nature is at its best. 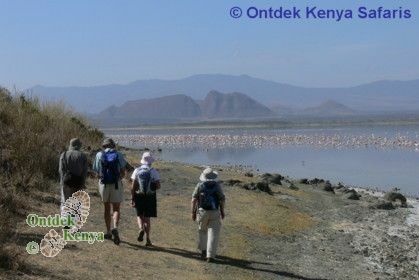 We do a walk in the nature conservancy followed by a trek on the crater rim from where we see the lake from various angles. Pleasant interruptions on the walks will be from giraffes, black and white Colobus monkeys, elands and a range of gazelles. The nearby Lake Nakuru National Park is the oldest park of Kenya. It's not only known for its thousands of flamingos but also for the vast herds of buffaloes, tens of rhinos and cats like leopard and lion. Of the big five only the elephant is missing. We do a game drive around the lake and have lunch at a viewpoint over the lake that is hardly visited by tourists. Afternoon transfer to the Sunbird Lodge where we'll stay for 2 nights. This small and luxurious lodge is built on a cliff overlooking Lake Elementaita and all the surrounding hills. The panorama is unmatched. Sunbird is not just a place to overnight, it's a place for total relaxation. Elementaita may not have the big name of Lake Nakuru but its scenic beauty is unmatched. A short descent takes us to the shores of the alkaline lake. From there we proceed up to the yellow fever tree forest, a haven for bird watchers. Afternoon is spent in the lodge or with an optional visit to the nearby Kariandusi prehistoric site, a site first discovered by Louis Leakey. We now take a break from walking to put all our attention to watching wildlife. To see the best of Kenyan wildlife, Maasai Mara is the place to be. Elephants, rhinos, giraffes, buffaloes, gazelles and all the big cats are found here. So, after breakfast we start our journey passing through Narok Town; a colorful Masai town. These are our cultural and activity days in Maasai Mara. 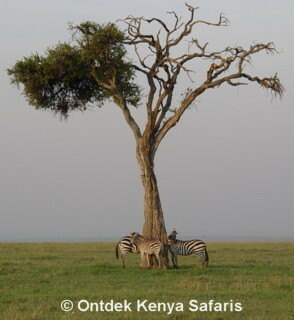 We do a morning game drive through the park and hike to a Masai manyatta (=homestead). Here we will see how the typical Masais live. An afternoon game drive makes the day complete. Our Africa hiking safari ends with a lunch at the Kiambethu Tea Farm. This is an old colonial home established by the early settlers and the pioneers of tea growing in Kenya. There will be a talk on tea: its arrival in Kenya, the growing, processing and up to when you put it into your cup. A short hike in the tea plantation and into a small remaining part of indigenous forest completes the tour. We have a healthy farm lunch and thereafter transfer to Nairobi for the evening flight out. PRICE: Our attractive price based on the size of your party includes all accommodation as per itinerary, all meals from breakfast of day 2 through lunch of day 10, all transport Nairobi-Nairobi and airport transfers, bottled water during the walks, services of guides, the park entrance fees and a Flying Doctors Evacuation cover. 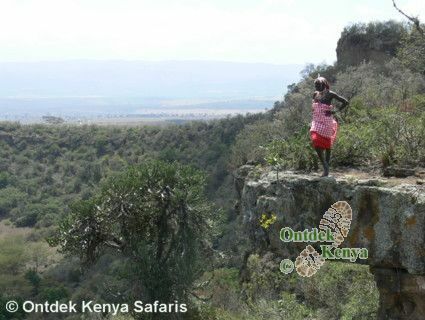 See our other hiking safaris in Kenya. 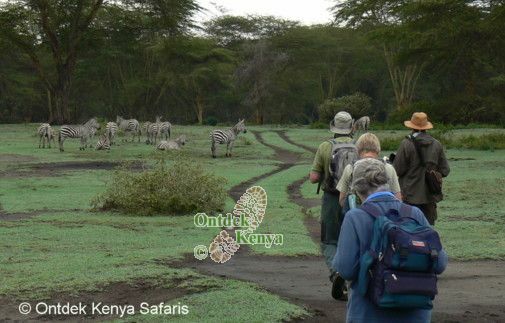 For a consultation on adventure tours in Kenya, contact Ontdek Kenya safaris, we have over 20 years of experience in organizing walking holidays in Kenya.